Hij was de startende C van het op een na laatste, niet NBA USA National Team. Had een meer dan aardige NBA carrière. Nu is hij DJ, zie het artikeltje en videointerview'tje op de site van de New York Times. Na 'the Brawl', de grootste vechtpartij in de geschiedenis van de NBA - gevolgd door de grootste schorsing (totaal voor het team), de wedstrijd Detroit Pistons - Indiana Pacers, begon de neergang van Kampioenkandidaat nr.1 Indiana. Het zorgvuldig door Larry Bird en Donnie Walsh opgebouwde team haalde nog wel de Play Off's (ze stonden eerste overall op het moment van het incident), maar er waren steeds opnieuw incidenten rond spelers, er volgen trades, en langzaam maar zeker verloren de Pacers terrein. Een complete afbraah van dat team, en heropbouw van een nieuw team volgden. Vorig seizoen stonden de Pacers voor het eerst weer in de Play Off's, ze deden het beter dan verwacht tegen nr. 1 Chicago Bulls, maar overleefden die ronde niet. Dit seizoen eindigden ze als derde in het Oosten, haalden simpel de tweede ronde na winst tegen het gehavende team van Orlando Magic, en werden kansloos geacht tegen Miami Heat in de tweede ronde. Bird is playing mind games here, just as he was during the legendary 1984 NBA Finals, when he called his Celtics teammates “sissies” after the Lakers ran Boston out of the building in a Game 3 blowout. In Game 4, the Celtics’ Kevin McHale nearly decapitated the Lakers’ Kurt Rambis, Boston scratched out an overtime win and Bird’s public rebuke now stands as one of those mysterious “turning points” of a classic NBA series. Bird is right that the Heat outrebounded Indiana 49-35, a gap that overstates things a bit, because Indiana missed 59 shots and gave Miami a huge number of chances to snag high-percentage defensive rebounds. The Pacers also lost the flagrant foul count 2-1, on all three judges’ scorecards, and they shot a disturbing 10-of-30 from within 8 feet, according to NBA.com. Those missed close shots, including a few “soft” finishes by center Roy Hibbert, resulted in several run-outs and bundles of the chaotic fast-break points that fuel Miami’s attack when its half-court offense goes through bouts of stagnancy, as it did on Tuesday. But with all due to respect to Larry Legend, when I watched Game 5 and reviewed pieces of it on Wednesday, I did not see a team undone by physically “soft” play. I saw a team that just has not been able to figure out the Heat’s fast, swarming defense. I saw a team that hasn’t been quite good enough to take advantage of the fleeting gaps that open up amid Miami’s frantic trapping and rotations. The Pacers have scored 97.1 points per 100 possessions in the first five games of the second round, according to Hoopdata, a number that would have ranked 29th in the regular season. That is a huge fall for a top-10 offense that improved dramatically as the season progressed. The decline is a result of both Miami’s defensive excellence and, to be frank, the fact that Indiana just might not have the talent to score enough in this series, which continues Thursday with the Pacers trying to avoid elimination at home in Game 6. Miami center Joel Anthony can’t shoot from outside dunking range and has rocks for hands, but the man is fast, and he’s already in West’s face before the Pacers’ power forward can even turn completely. Anthony’s rotation means that Hibbert should be open, but as you can see under the hoop, Dwyane Wade has jumped off Dahntay Jones in the right corner to crash on Hibbert. For the Pacers to succeed here, West has to make a pass immediately. 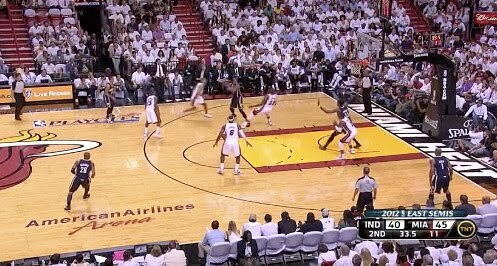 Holding the ball is usually fatal, as it is on this LeBron James steal. But what is West supposed to do? He’s not an elite passer, though he’s a good one, and a skip pass to Jones is risky, given that West is on his heels and James is playing free safety on the weak side. And even if the pass does get to Jones, Wade is super-fast and would be able to scramble back in time to contest any shot attempt. Pacers guard Leandro Barbosa should ideally be an option here, but he has curled out toward half-court for reasons clear only to him. This is great defense and overwhelming talent against imperfect spacing and decent talent. What jumps out is that the 7-foot-2 Hibbert is standing open at the basket. But Hansbrough doesn’t make the pass immediately. He brings the ball down to his waist, brings it up again and then tries to thread a pass into Hibbert. Too late. Waiting is death against Miami. Why does Hansbrough fail here? For one, Miami’s defense, again, is quite terrifying. Two fast big men, Anthony and Udonis Haslem (who was suspended for Game 6 for a flagrant foul on Hansbrough), are converging on him at high speed. Wade, one of the best athletes in the league, is lurking behind Hibbert again. But Hansbrough also isn’t much of a passer, and it takes elite skills and confidence to make this kind of pass immediately. Hansbrough had 30 assists the entire season. Also a slight problem: Point guard Darren Collison and Barbosa are fairly close to each other on the perimeter, and Collison is inside the three-point line. The spacing is less than perfect, making it easier for one Heat player to defend multiple Pacers. It also makes any potential rotations shorter, in terms of distance. Is it possible the Pacers just don’t the horses to score on quick-hitting, intricate stuff like this? That Miami’s talent/speed advantage is just overwhelming? Maybe. But the Pacers can surely do some things better to loosen up the offense. West can overpower Shane Battier, and though he has missed 13 of his last 21 shots, most of them have been decent looks, and more are bound to fall. Getting the ball to Hibbert in the post more is a must, though Miami has made this tough by fronting him and having help ready to contend with any lob pass. The Pacers’ coaching staff needs to figure out ways to get Hibbert a half-dozen more post-up chances, whether via cross screens under the hoop from West or Danny Granger (who is expected to play in Game 6 despite a sprained ankle), clearing lanes for those lob passes or having Hibbert duck into post position on those West pick-and-rolls. Frank Vogel is a good coach with a smart staff, and they will surely figure out other tricks. • Hibbert as the roll man in pick-and-rolls. Indiana has been doing quite a bit of this throughout the series. Though the results have been hit-or-miss whether Hibbert tries to score or pass in the manner West attempted above, using Hibbert in this way has potential for one big reason: If Miami is playing small, with James at power forward and typically guarding a shooter, bringing Hibbert’s defender out against a pick-and-roll takes Miami’s only true big man out of the paint. Hibbert should be able to finish more plays like this, if he goes up strong and keeps his composure: Indiana also had a lot of success running the offense through Hibbert at the elbow in Game 3, something it didn’t do much of on Tuesday. • Run through those progressions. It sounds simple, but if option No. 1 fails, be prepared right way to go to the second option and beyond. Here’s Collison, a consistent bench spark for most of these playoffs, calling for a Granger screen after the initial West pick-and-roll fails: Collison is able to turn the corner, and the result is a decent look for Hansbrough. Granger has long been an effective screener in pick-and-rolls, so this is a nice counter. So is this: This play has two things: 1. Hibbert facilitating from above the elbow, something that has been effective in stretches; 2. An interesting little way to use Battier’s fronting of West against the Pacers. The play starts with Battier fronting West at the left elbow, and rather than try to force-feed things there, the Pacers have West simply slide sideways and serve as a screener for Granger as Granger curls toward the top of the arc. Granger doesn’t get a great look here, but it’s nice playmaking from the Pacers. It’s clear now that they are going to have to stretch the playbook to beat this Miami defense, and to act with decisiveness in general. That is much, much easier said than done against one of the league’s best defenses. Links naar NBA-clips van Game-6Het was een mooie serie! “De tragedie van de moderne man is niet dat hij steeds minder weet van de zin van het leven, maar dat het hem steeds minder interesseert.” Dat zei de in december overleden Václav Havel ooit. Het is de insteek van deze korte maatschappijkritische film. In Modern Zamanlar (‘Moderne Tijden’) van de Turkse producer en regisseur Aykut Alp Ersoy wordt zonder woorden de moderne tijd, waarin we overal en altijd verbonden willen zijn, in subtiele kritiek gegoten. Ook het de Rap-clip (Nomad - Amerika Rüyası (Music Video)) van dezelfde maker is trouwens de moeite waard. Drievoudige, viervoudige...OT's, it's in the air! Waar de rappe tong van Joe Biden toe kan leiden. Niemand in het Witte Huis, Barack Obama voorop, had zin om het politieke mijnenveld van het homohuwelijk te betreden. De meningen over het onderwerp zijn scherp verdeeld, en in een verkiezingsjaar kan het helemaal verkeerd uitpakken om aan gevoelige thema’s te morrelen. Maar Joe Biden is een recidivist in versprekingen en (te) snel commentaar. Biden gaf vorig weekend een interview aan NBC en zei “geen probleem” met homoseksuele echtparen te hebben. Het debat wakkerde aan, zeker nadat North Carolina deze week per referendum besloot het homohuwelijk in de Grondwet te verbieden. De roep om een standpunt van president Obama werd luider. Het mag dan electoraal veilig lijken om een onderwerp als homoseksualiteit te mijden, Obama moet ook homoseksuele donateurs tevreden houden. Juist in die kring werd de laatste weken gemopperd over het zwijgen vanuit Washington over homorechten. Obama werd geconfronteerd met het dilemma dat president Bartlet in de tv-serie The West Wing werd voorgelegd door een homoseksuele donateur. Spreken kost je kiezers, zwijgen kost je donateurs. Bekijk het fragment hier. Bartlet zweeg uiteindelijk. Maar Obama koos ervoor te spreken en omarmde het homohuwelijk in een stap die links en rechts als historisch wordt gezien. Hij voelde zich gedwongen, blijkt uit dit goed geìnformeerde artikel op Politico. Het was een sprong in het diepe, maar zo slecht lijkt het Obama uiteindelijk niet uit te komen. Reacties uit de Democratische achterban zijn euforisch. De helft van de kiezers is voor het homohuwelijk, en dat percentage stijgt doorgaans. Hij voelde de veranderende tijdgeest dus goed aan. En de afkeuring vanuit conservatief Amerika is relatief mild. Mitt Romney lijkt het spel niet mee te willen spelen. Hij kiest ervoor de koers van zijn campagne niet te verleggen. Het gaat over de economie, en niets anders. En als het per omgeluk toch over iets anders gaat, wordt hij boos. Het leidde bovendien tot een schadelijk (en ingestoken?) verhaal in The Washington Post, waarin stond dat Romney een homoseksuele oud-klasgenoot had getreiterd. Romney excuseerde zich voor zijn gedrag, al kon hij zich, zei hij, niet alles precies meer herinneren. Zo heeft Joe Biden, is de conclusie aan het einde van de week, per ongeluk een meesterzet gedaan. Je zou kunnen zeggen, concludeert Slate Magazine, dat Biden zo’n stap heeft gezet die eens in de dertig jaar voorkomt. Het gebeurt zelden dat een vicepresident het verschil maakt. Het heeft iets verfrissends dat toevalligheden in het door en door gespinde Washington soms de doorslag geven.